Thus, an NDB Cluster with 4 data nodes has 4 node groups if NoOfReplicas is set to 1 in the config.ini file, 2 node groups if NoOfReplicas is set to 2, and 1 node group if NoOfReplicas is set to 4. Replicas are discussed later in this section; for more information about NoOfReplicas, see Section 5.3.6, “Defining NDB Cluster Data Nodes”. You can add new node groups (and thus new data nodes) online, to a running NDB Cluster; see Section 7.15, “Adding NDB Cluster Data Nodes Online”, for more information. See Section 6.3, “ndbmtd — The NDB Cluster Data Node Daemon (Multi-Threaded)”, for more information. 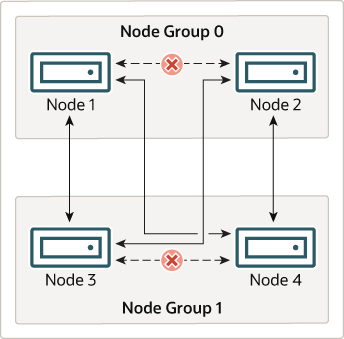 For more information relating to NDB Cluster and user-defined partitioning, see Section 3.7, “Known Limitations of NDB Cluster”, and Partitioning Limitations Relating to Storage Engines. In NDB 7.5.4 and later, the maximum number of node groups supported for a single NDB Cluster instance is 48 (Bug#80845, Bug #22996305).